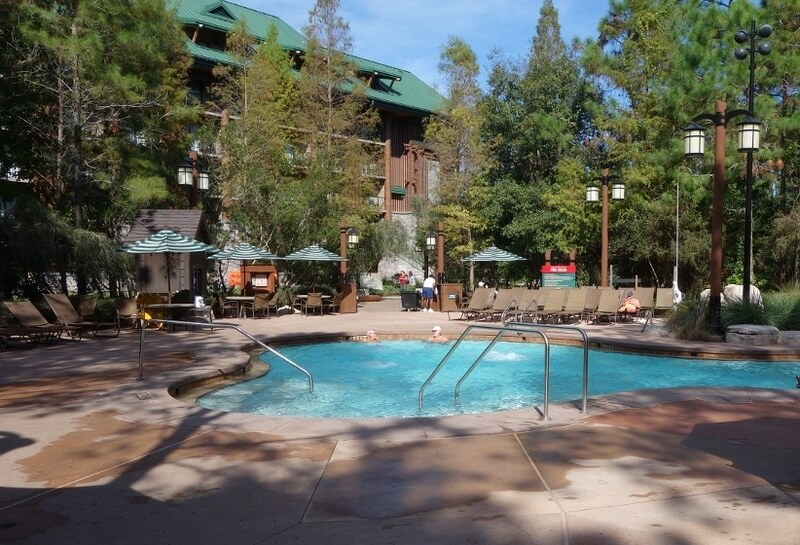 For the first page of this review of Disney’s Wilderness Lodge, click here. 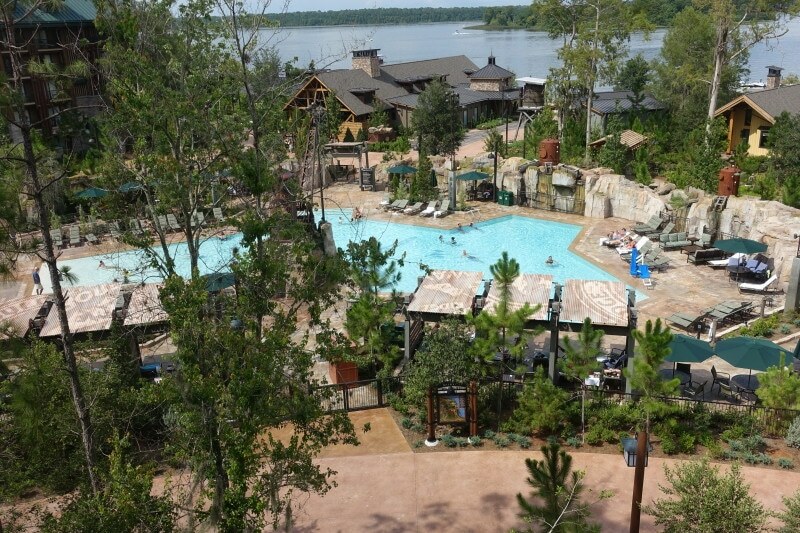 Disney’s Wilderness Lodge came out of a major construction project in July 2017. 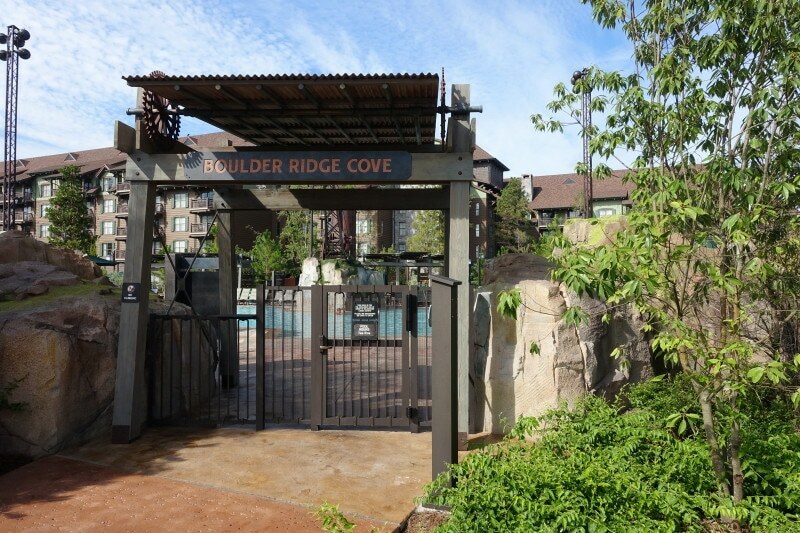 Part of it was the gutting and re-do of the old quiet pool here into what is essentially a brand-new pool, which has been named the Boulder Ridge Cove pool. 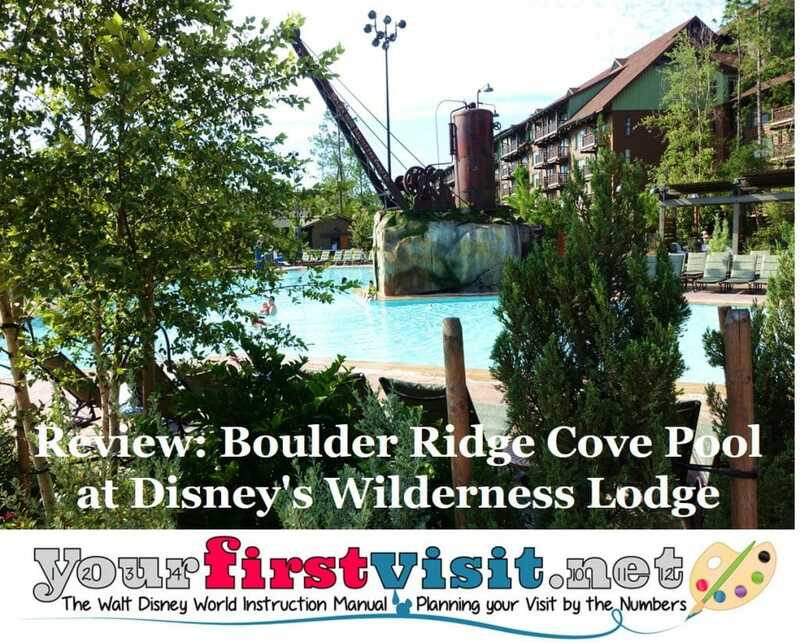 The Boulder Ridge Cove pool is nestled between the re-done wing of the main Lodge, which is now the Copper Creek Villas, and the older Disney Vacation Club offering that has been renamed Boulder Ridge Villas. 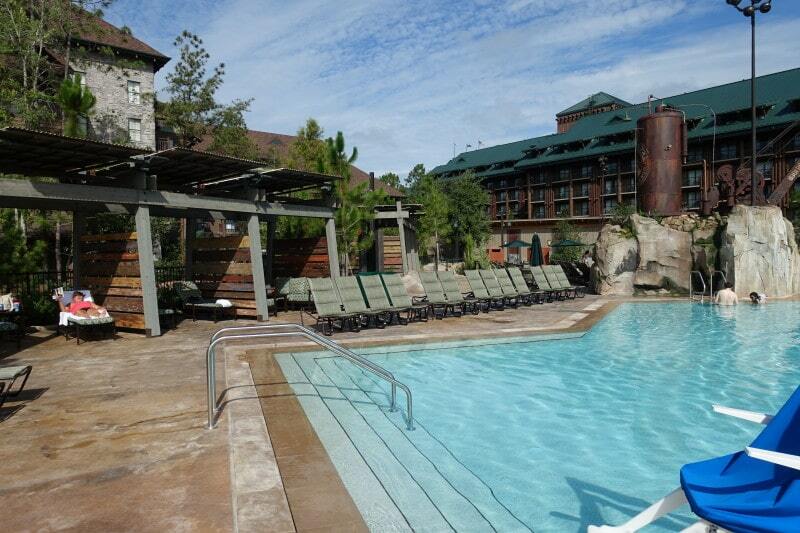 It’s open to all Wilderness Lodge guests–you don’t have to be staying in one of the Villas to use Boulder Ridge Cove. 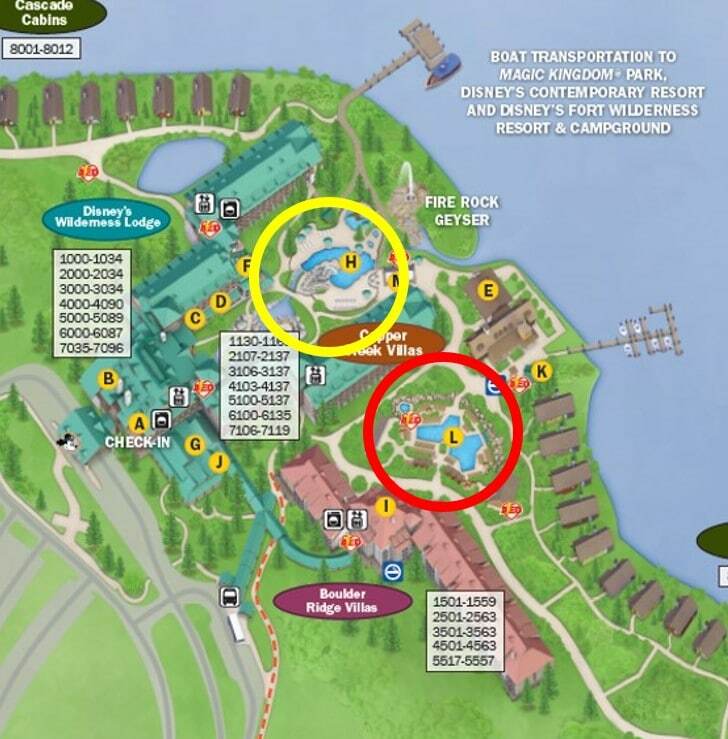 On the map, the new pool is in red, and the main pool, refurbed in 2014 and renamed in 2017 the Copper Creek Springs pool (it used to be the Silver Creek Springs pool), is in yellow. The former pool here was largely an un-themed concrete pool surrounded by trees. 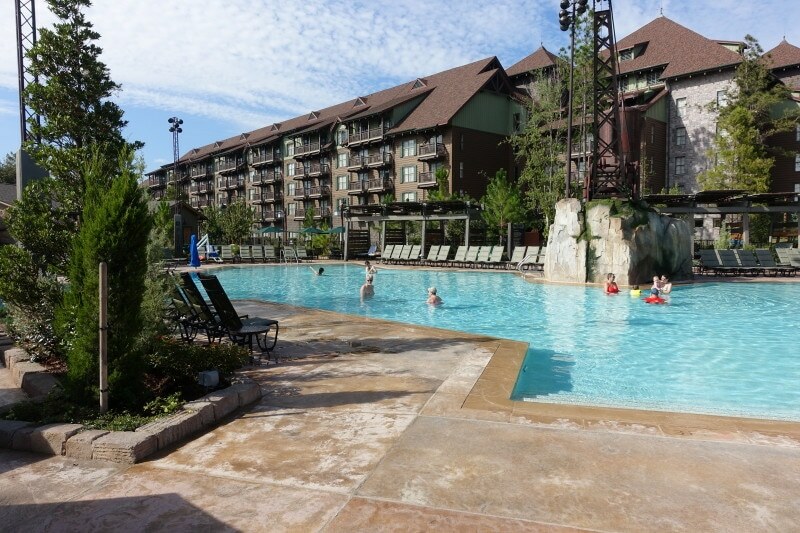 The new pool (seen above from the top floor of Boulder Ridge Villas) is larger than the old one, deeply themed, and has extensive amenities. 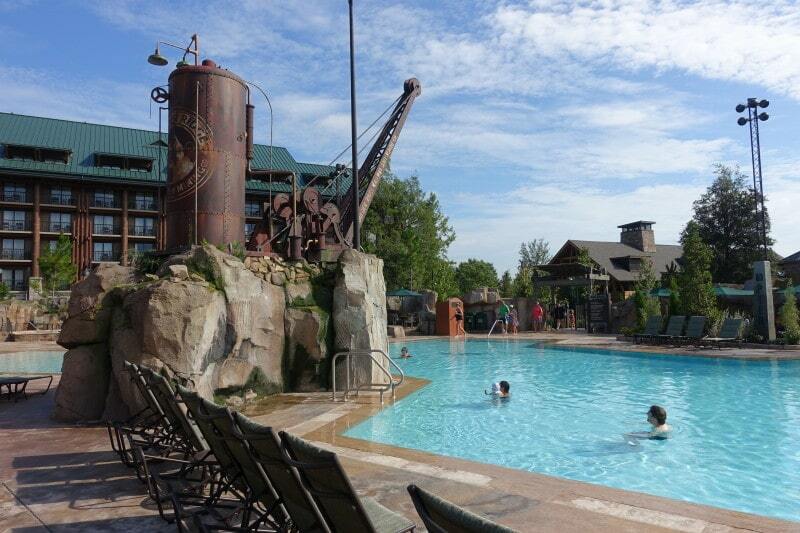 For adults, it’s perhaps even better than the main Copper Creek Springs pool because of its deeper theming–mining and railroad-related–and additional amenities. 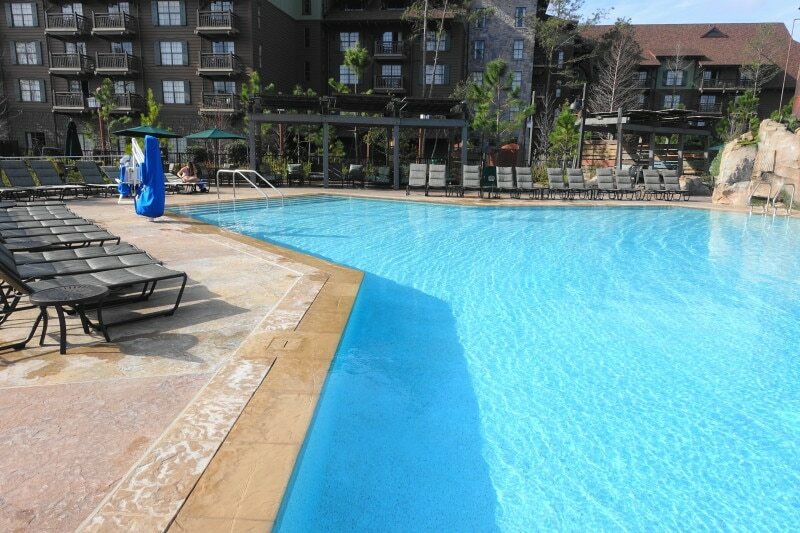 Kids will likely still prefer the main Springs pool with its slide, games, and water play area. 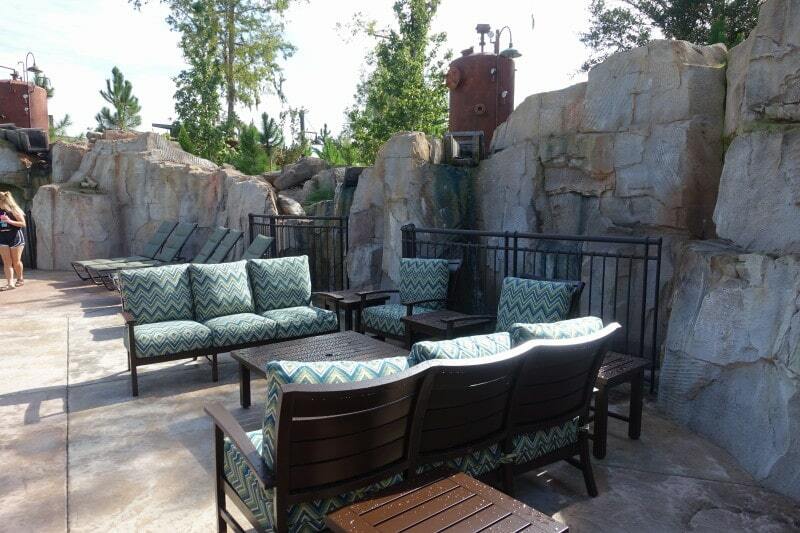 There’s several entries to the fenced-in pool, including this one from near the new Geyser Point bar and grill, which provides quick service food and a refillable mug station. Here’s a walkabout of the new pool beginning at that entrance. In the distance on the far right of this shot is the zero-entry point of the pool. 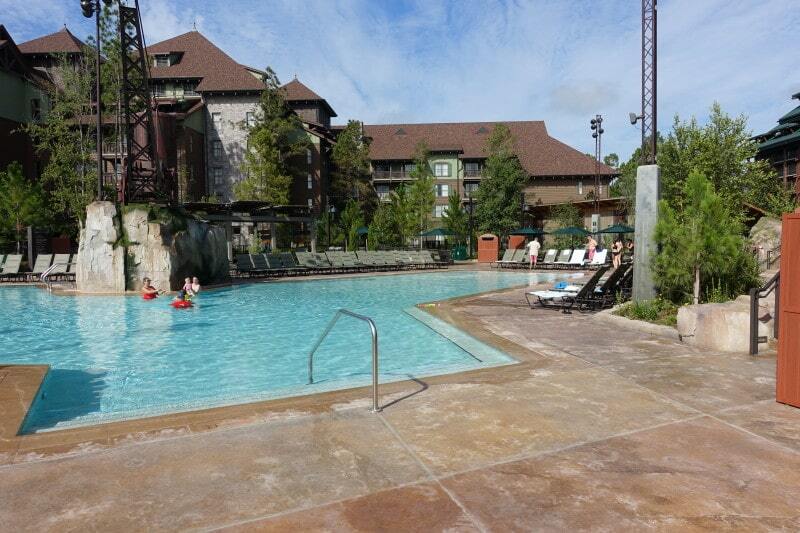 Boulder Ridge provides the backdrop to this side of the pool. 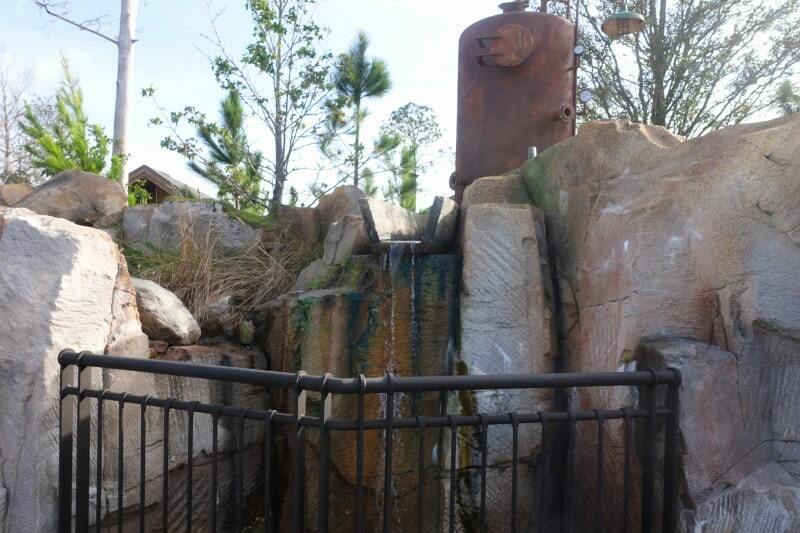 Note the steam crane, the principal theming object of this pool. 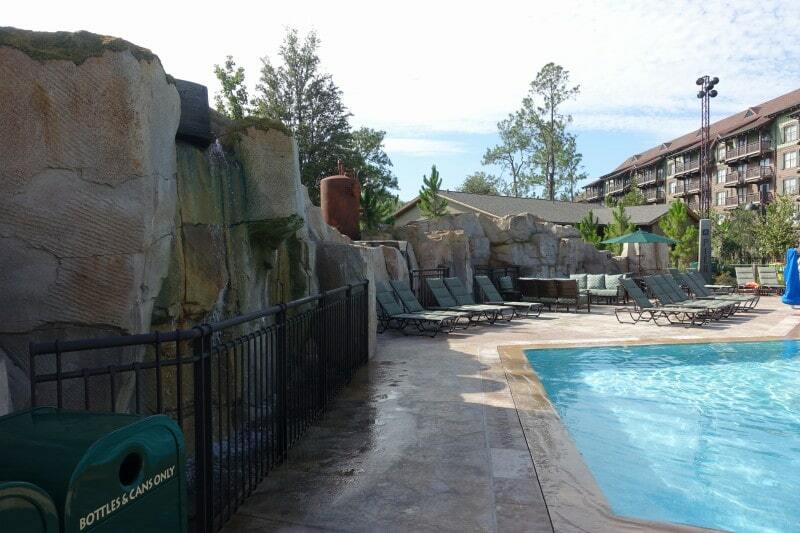 This side has a wall–a quarry wall?–that separates the pool from the nearby new Cascade Cabins. A detail from this wall. A better view of the steam crane, backed by the Copper Creek wing of the main Lodge. 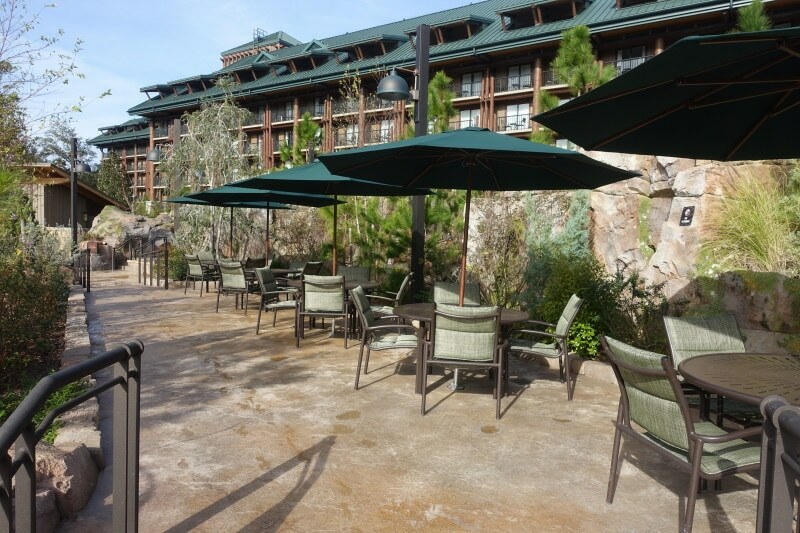 There’s a delightful variety of seating options that you won’t see at most other Disney World pools. More from this side of the pool. 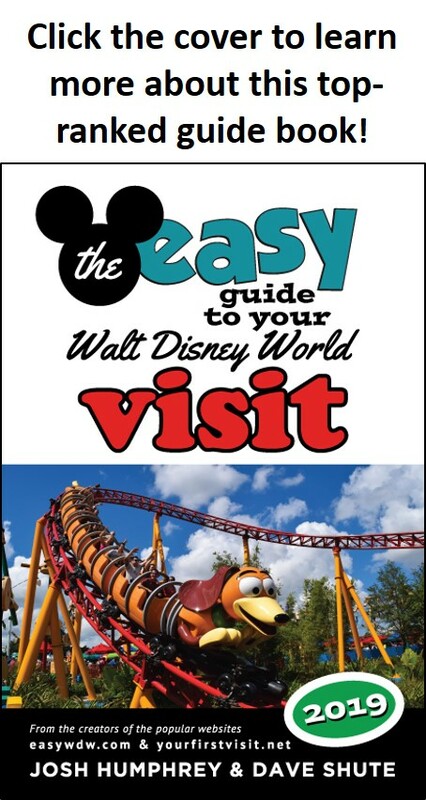 The zero-entry area is at the opposite end of this image. A closer view of the steam crane. Geyser Point is the one story peaked-roof building at the right. 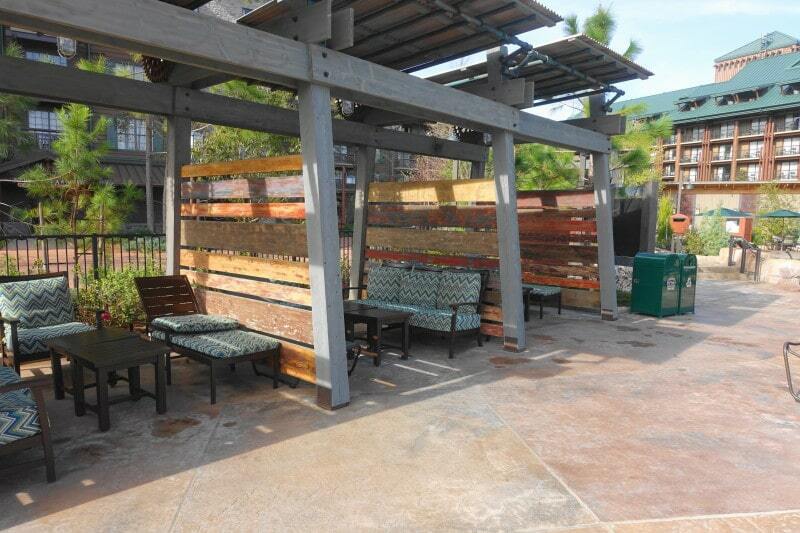 …plus more shaded seating on the Copper Creek side. 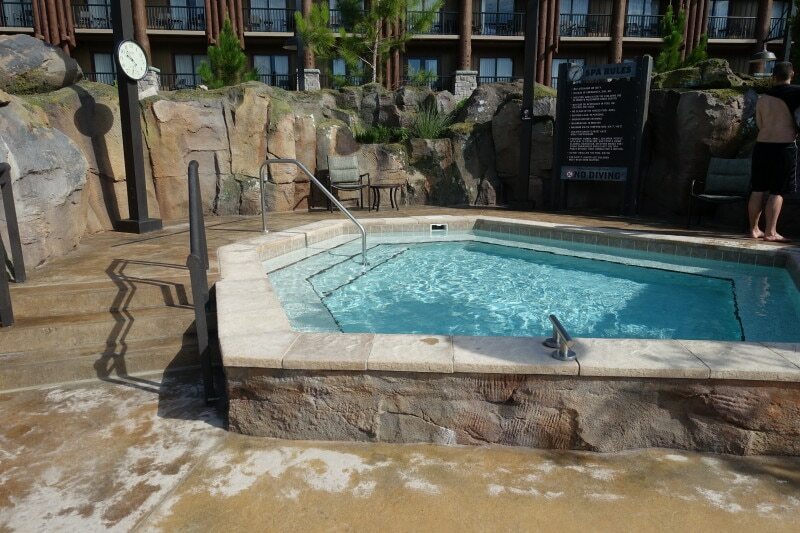 Also on the Copper Creek side is this hot tub. This pool has quickly become a favorite. I can’t wait to enjoy it next month! 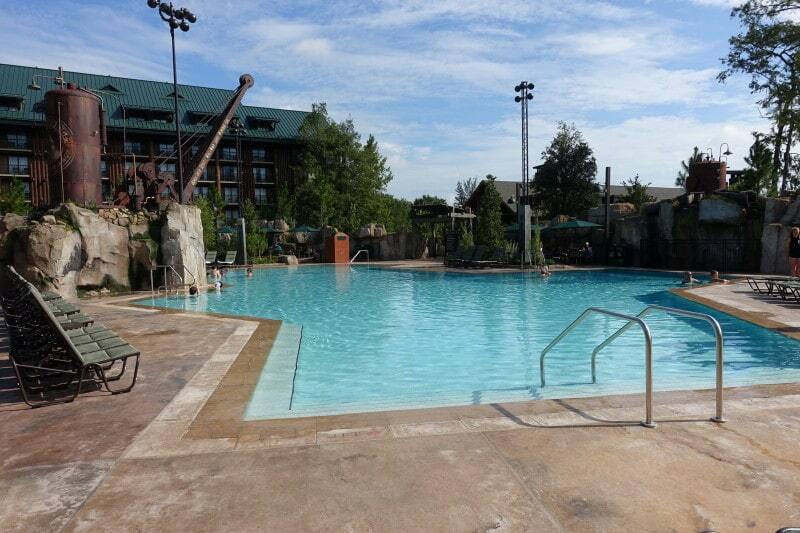 Does this pool stay open late like the quiet pools at Saratoga Springs? Our home resort is BLT but the pool (hot tub specifically) closes at 8PM in January so we have started staying at SSR to take advantage of the hot tub later. 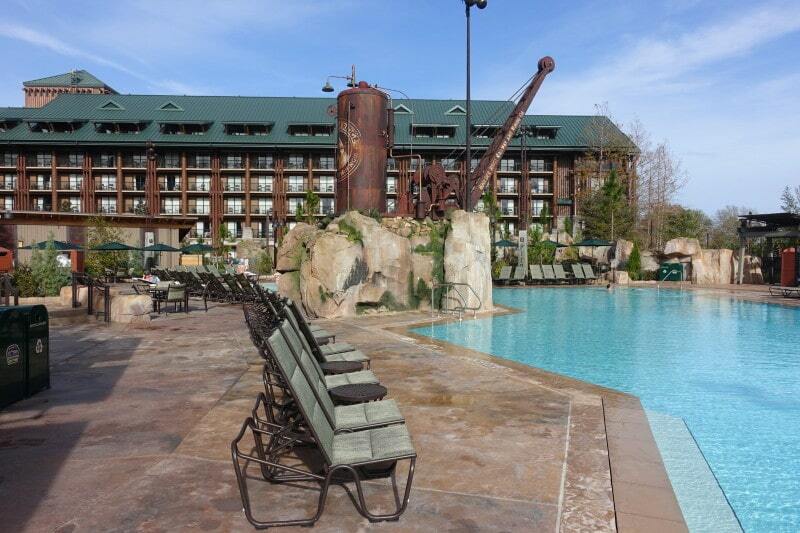 We recently added on at Copper Creek and are booked to stay there January 2020. Thanks! Joanne, great question, but I do not know for sure. My guess is no, as it is also open to regular WL folk, and thus likely follows typical hotel patterns.